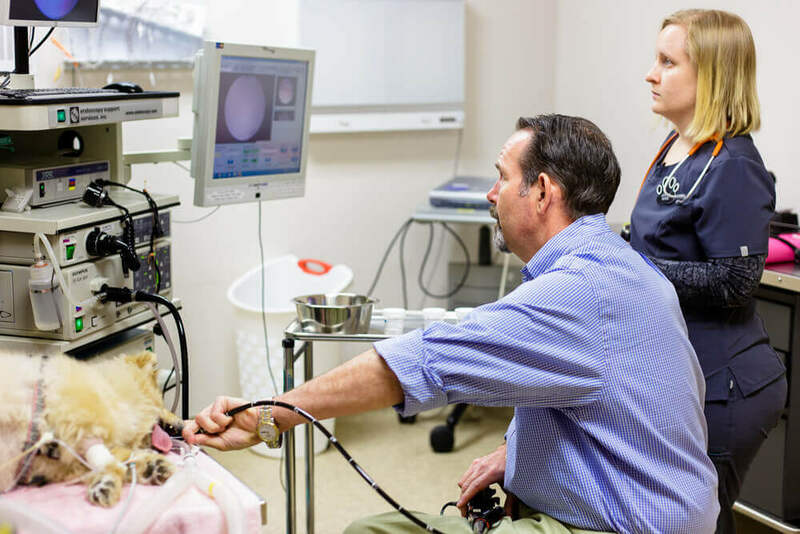 There are many forms of endoscopic examination in dogs and cats. The type of endoscopy that is performed depends on the organ system being evaluated. Types of endoscopic examination offered at the Specialty Center include: upper gastrointestinal endoscopy, lower gastrointestinal endoscopy (colonoscopy) which may be either flexible or rigid, rhinoscopy, cystoscopy, and bronchoscopy. Endoscopy always requires general anesthesia and carries risks associated with anesthesia. If you are anticipating an endoscopic examination for your pet, they should be fasted after midnight on the day prior to your appointment. Water may be given safely. In some cases, you pet may be discharged from the hospital on the same day of admission. In other cases, we may recommend that your pet stay overnight. In still other cases, an endoscopic examination may be delayed for a few days so that additional diagnostic testing may be performed. Flexible colonoscopy-evaluated entire colon and ileum. Biopsy of normal and abnormal tissue. Samples will be submitted to the pathologist for review. Culture of tissue or fluid samples. Collection of stones for analysis.